The 2nd Annual ERR Fun Day was a wonderful success! Thank you to all who came out with their horses and spent the day with us. We were able to pay for hay, grain, wormer and veterinary care - THANK YOU! Austrian Col. Ottomar Herrmann Jr. helped rescue Lipizzan horses during World War II. Performances were held to benefit ERR's rescued horses! Performances tentatively scheduled for Friday, June 25th at 7:00 p.m., Saturday, June 26th at 7:00 p.m. and Sunday, June 27th at 2:00 p.m. Private lessons on a Lipizzan Stallion will be available to intermediate and advanced riders through ERR and at the discretion of the Herrmann family. Press conference and reception will be held. Check back for more details! Lots of volunteers needed. 4H, youth and senior groups, contact us regarding volunteer opportunities, private stable tours and discounted tickets! ERR volunteers will be on hand with 2nd hand tack and offer educational materials to the public. This event is being held along with the Walker Valley Fire Department and all proceeds from the evening will be split 50/50 between ERR and WVFD. First 100 children will receive goodie bags. Coffee, Hot Chocolate and Baked Good to warm your soul will be available. Donation of $4.00 per person. Volunteers needed to help scare the guests, guide the tours and help with set ups. Our 3rd Annual Fun Day will be held in beautiful Orange County Park, which is off of Route 416 in Montgomery. Easily accessible, with one main ring and a warm up ring. Plenty of parking, picnic tables and a pavillion. Bring the family and your horses, because we're going to end the show/riding seasing with some FUNdraising and good times! Divisions: leadline, peewee, walk/trot 12&over, junior, open and driving. Classes: costume, barrel crawl, socks-in-the-box, barrel dash, straight line barrels, cloverleaf barrels, pole bending, ride-a-buck (cash class), driving obstacles. CASH BACK BARRELS!!!!!! This class will run only if we get a minimum of 10 entrants - $25 entry fee. Cash awards paid at the end of the day. $5 entry fee per class (excluding Cash Back Barrels). Ribbons will be awarded. Stalls are available, $10 each. There will be a food and drink available at a concession stand. Meet new friends, see old friends, talk horse and gave a good time! Hope to see you all there! Class Sponsorships, Division Sponsorships and Journal Ads available. Email for more details. Check out pictures of the 2001 ERR Fun Day! Employees from Wakefern and Shoprite will be spending the day at Hill Haven! The critters will be getting massages from a therapist, volunteers are willing to build a new run-in shed, and all buildings will be painted to help preserve the wood and make the surroundings here a little more aethestically pleasing. If you have lumber to donate, or can help with the run-in shed by donating a Home Depot Gift Card, it would be appreciated, as we have to supply the building materials. Serving hotdogs, hamburgers, veggie burgers, snacks, soda, water and baked goods. Educational materials will be available to the public. Donations of baked goods, breads, paper plates, napkins and condiments will be greatly appreciated! Come on out to Kingston and get out of the heat for a few hours! Pick up a ticket for the new movie, Seabiscuit and visit with folks from ERR. We have been invited to set up a display in the lobby of the movie theatre, which will tie in to the release of the movie Seabiscuit. What a wonderful opportunity to reach a broader audience and educate on the issues surrounding equine welfare. If you have time to volunteer and man the table for 45 minutes prior to a show time, drop us a line! Come out, support ERR and enjoy a lovely day of phenomenal hunter/jumper action in multiple rings. Admission is $5 for all ages, except those 12 and under. $50,000 Grand Prix scheduled for 1:00 p.m. with world class riders, this is not to be missed! Advance tickets available through ERR with 100% of the proceeds donated to our rescue program! A portion of gates sales will also benefit our charitable organization. ADVANCE TICKETS NOW AVAILABLE AT HILL HAVEN FARM! Call (845) 744-1728 to reserve yours today! Tack, novelties and household items for sale. Even if you don't find something you like, come out for lunch. ERR will be firing up the grill and selling food, baked goods and beverages. Pistol Packin Pete will be visiting with the children and we'll be presenting information on equine rescue and nonprofit organizations. Our President, and Chair of the NYSHC's Humane Committee, will attend the Board of Directors meeting. Humane issues will be a focus, specifically equine cruelty investigation and developing support systems for humane efforts. Visit us! We will be distributing educational information and promoting equine welfare. This program will explore the prosecution of animal cruelty in a step-by-step process from investigation, to arrest, to prosecution, to sentencing. It will include discussion of warrant requirements, the role of SPCAs and/or the police in investigating animal cruelty allegations, how animals are dealt with pending prosecution (including seizures of animals and bond requirements), the necessary factual predicates for misdemeanor versus felony animal cruelty charges, defenses, and penalties, including the possibility of barring convicted animal abusers from possessing animals in the future. ERR President attended. 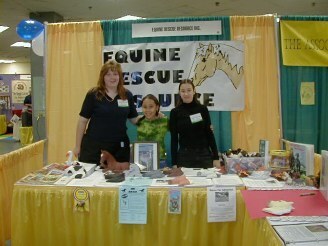 We set up a booth with 2nd hand tack and offered educational materials to the public. ERR spent the weekend meeting leaders of the equine industry, networking and educating on equine welfare issues. A silent auction was held as a benefit and proceeds benefitted ERR. ***UPDATE*** Proceeds exceeded our expectations - thanks to all that supported ERR during this event, we've built a new run-in shed and acquired portable corral panels! Our 2nd Annual Fun Day will be held in beautiful Orange County Park, which is off of Route 416 in Montgomery. Easily accessible, with one main ring and a warm up ring. $5 entry fee per class - ribbons will be awarded. Stalls are available, $15 each, reservation suggested but not required. Show Schedule: Fri. 6/21 at 7:00 p.m., Sat. 6/22 at 7:00 p.m., Sun. 6/23 at 2:00 p.m. Adults $15, Youth $8, Children under 6 are free! Advance, senior and group discount tickets are available NOW! 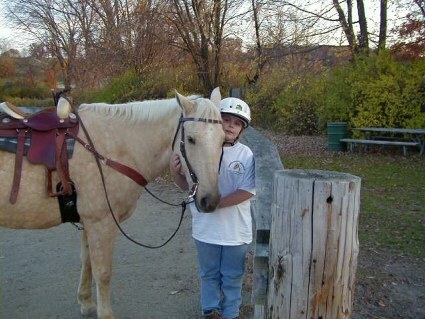 Private lessons on a lipizzan stallion $75, by appointment only, must be at least an intermediate rider. Deposit required. Training Clinic on Saturday, 6/22 at 10:00 a.m. $125, reservations/deposits required. 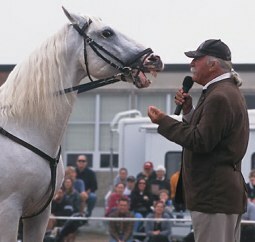 Check out the 2002 Lipizzan Event Site! December 1, 2001 - Cee Segarra, the new Chair of the NYSHC's Humane Committee will be speaking on the topic of horse slaughter and welfare. November 4th Fun Day will be held in beautiful Orange County Park, which is off of Route 416 in Montgomery (across the road from out satellite farm - Millenium Horse Farms). Easily accessible, with one main ring and a warm up ring. Plenty of parking, picnic tables and a pavillion. Bring the family and your horses, because we're going to end the show/riding seasing with some FUNdraising and good times! $2 entry fee per class - ribbons will be awarded. Poles, barrel dash, straight line barrels, cloverleaf barrels, crawl through barrels, sox in the box and costume classes! Bring a dollar and "Ride-A-Buck" - winner takes all in this class! Helmets, proof of rabies vaccinations and a negative coggins are required at registration. Wings and Things is putting together a great spread $15 for non-riders and $25 for riders (which includes entry fees for one division) Continential Breakfast and Beef or Pork BBQ plates for lunch, cobbler for desert, breakfast and lunch beverage included. Contact Cee, Chip or Sheri for advance tickets or with questions. Meet new friends, see old friends, talk horse and gave a good time! Visit us, we're at Booth 95. We will be distributing educational information and promoting equine welfare. October 14th Lynda Broas of Equine Rescue Inc. will hold a schooling show at beautiful Willow Hill Farm in Montgomery, NY. Proceeds from this show will help cover the costs of hay, shavings and overall care of the horses at Equine Rescue. Food concessions, awards and prizes. They have been kind to offer us a booth space, so the ERR will be on hand with educational material. October 12, 13, 14. K.C. LaPierre, assisted by Anthony Madaia, will hold the clinic. Prices vary depending upon the day and if you bring your horse along. Tools you have been trained to use will be available for sale. If you wish to travel to attend, we will gladly accomodate him/her for the duration of the clinic. Food concessions will be available. We have once again been invited to attend the NYSHC's annual meeting of directors. We had attended the 2000 Fall Meeting and made a full presentation on many of the aspects related to horse slaughter and how they affected NY State. This year we will discuss changes, improvements, necessary action and proposed legislation. We have been given an education opportunity and will talk about equine welfare issues in NY and provide hand out materials. We were on hand to help out with ring work, record keeping and have some fun! A great time was had by all. We were on hand to distribute educational information and promote equine welfare. Free raffles for the children were held, refreshments were offered and books were sold. Benefit for Equine Rescue Resource and Equine Rescue Inc. These stallions were magnificent, executing their movements precisely and just performing beautifully. Col. Herrmann is scheduled to return for another benefit in June 2002! Please check our event website for more information on this past show and check for updates on the upcoming 2002 show as we plan this spectacular event.